Dogs can itch for a number of reasons. Parasites, allergies, environmental factors and skin infections are four of the more frequent sources of irritation that cause a dog to itch. Medications are used to relieve itching from all of these sources; however, some treat the source of the itching while others only treat the itching itself. 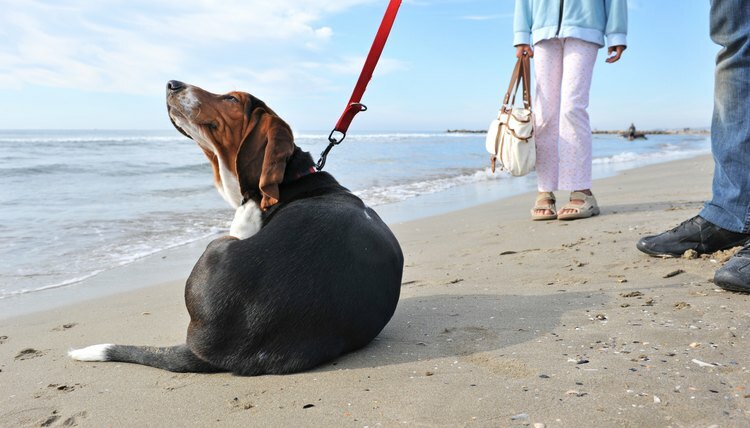 Itching is typically a response to something in, on or surrounding the dog that is causing an irritating stimulus. Common causes of itching can be broken down into four categories. Parasites that live on the skin or burrow under the skin may or may not be visible, but can cause itching due to biting or burrowing under the skin. Allergies consist of the response a dog has to something in her environment or that she has consumed. Grass, food and certain drugs are common causes of allergic responses. Environmental factors may include pollutants or chemicals, such as cigarette smoke or laundry detergent, that settle on the dog’s skin. Finally, skin infections are often secondary to other causes that reduce a dog’s resistance to disease. For example, a dog who has a severe grass allergy also may develop a bacterial infection due to her immune system being depressed. According to the Merck Manual, Pet Edition, itching is only the symptom of a problem, rather than being the problem itself. Your veterinarian will begin making a diagnosis by examining her for external parasites and other skin issues. He may perform a skin scraping of the affected area or recommend an elimination diet, if allergies are suspected. It is necessary to identify the cause of the itching to treat it effectively. Anti-inflammatory steroids are effective treatments for itching. Most dogs will quickly respond to an injection of steroids. However, steroids should be used in the lowest effective dose possible and only with awareness that their use involves risks. Glucocorticoids can increase hunger, thirst and urination; suppress adrenal gland function and increase diabetes risk. Steroids also are available in tablet form and in creams. Antihistamines are drugs that block the release of the compound that causes the response to an insect bite or allergen. These drugs are frequently prescribed to treat itching; however, unlike steroidal drugs, they are not as efficient when it comes to treating itching. A test period of 7 to 10 days is required to determine if a particular drug is efficacious to treat a particular condition in your dog. The over-the-counter drug Benadryl is a type of antihistamine. Some itching can be treated using over-the-counter drugs formulated for humans. These drugs only should be used when recommended by a veterinarian, as they might have drug interactions or other negative effects if used improperly. For example, only the formulation of Benadryl containing diphenhydramine as its sole active ingredient should be used when treating dogs. Omega-3 fatty acids are often used to treat itching from a dry coat, but they are most effective if used with antihistamines.